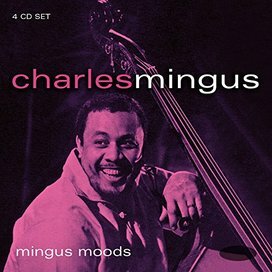 This new Properbox set surveys Charles Mingus’ principal recordings from 1956 to 1960 some of which must of necessity be included in any truly representative jazz collection: the music is simply essential and requires no special endorsement from the likes of myself. Most seasoned jazz fans will own it already in either LP or CD form and newcomers will need to decide whether to buy it as a compilation package or seek out the original discs. This re-issue starts with the complete `Pithecanthropus Erectus` album featuring Jackie McLean as a principal soloist; two tracks from `The Clown`, a somewhat neglected opus ; all `Tijuana Moods` except the `Colloquial Dream` narrative ; `Eastcoasting`, an album made for Bethlehem Records and featuring pianist Bill Evans ; three tracks from `Blues and Roots`; the entire `Mingus Ah Um` , his magnum opus, continuing with five tracks from `Mingus Dynasty` and finishing with the entire Candid Records album `Charles Mingus presents Charles Mingus` plus two from the follow up album recorded at the same session and simply entitled `Mingus`. The Mingus `idée fixe` permeates this music from beginning to end. His veneration of Ellington, blues and gospel music combined with be-bop and `Third Stream` classical elements plus just enough free jazz frissons to add a touch of seasoning, all moving towards the realisation of some vast masterwork that he was unable to complete in his lifetime. Like the composer Mahler , Mingus tried to embrace the world within his musical ambition and though he never completed his ultimate masterpiece all the elements of that aspiration are present in music contained in these discs and at least two : `Pithecanthropus` and `Ah Um` stand on their own as milestones in the development of modern jazz. Personally I would want to have the complete recordings with the original track order, sleeve notes and cover art but for economy of effort and finance the Properbox provides a useful way to dive in. The accompanying booklet provides a detailed account of the circumstances surrounding the creation of the music referencing Brian Priestley’s indispensible, and as yet unsurpassed, Mingus biography of 1982.